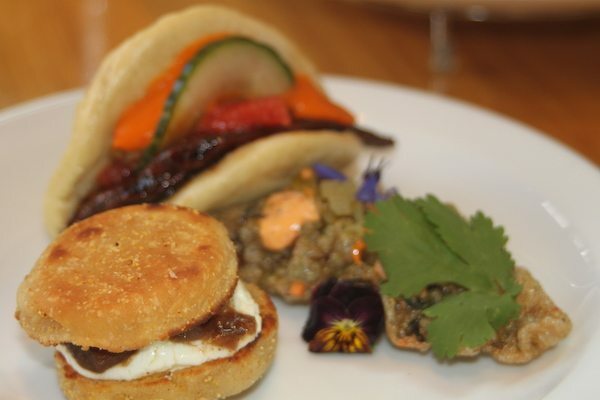 Located in the heart of the city, in The Lanes, Terre à Terre is an acclaimed vegetarian and vegan restaurant that proves you don’t need meat and fish to get great tasting food. As they say themselves, they make ‘vegetarianism more about indulgence than abstinence’; one meal at Terre à Terre and you won’t argue with that. 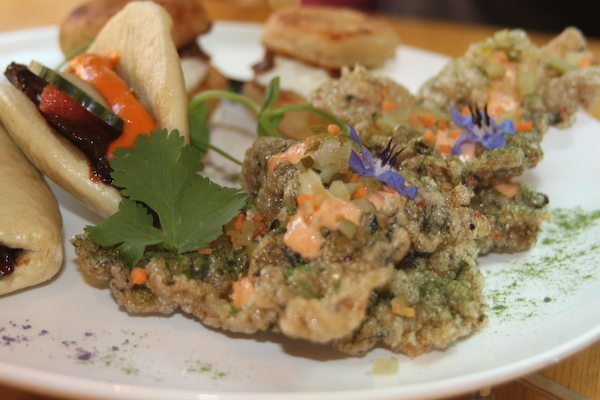 Every dish on the menu is clearly there to excite the taste buds and challenge any preconceptions about eating veggie. Confident that everything Terre à Terre touches turns to gold, I jump at the chance to try out their take on traditional ‘Afternoon Tea’. Served daily between 3-5pm – bridging the gap between lunch and dinner – Terre à Terre offer up a menu fit for kings. Making sure all tastes are catered for, unique and inspired mini dishes make up these multi-tiered delights. There is no question that indulgence and pure satisfaction has been at the forefront of the creative minds when designing this menu. Reading through the menu, it becomes apparent that we are in for a treat. 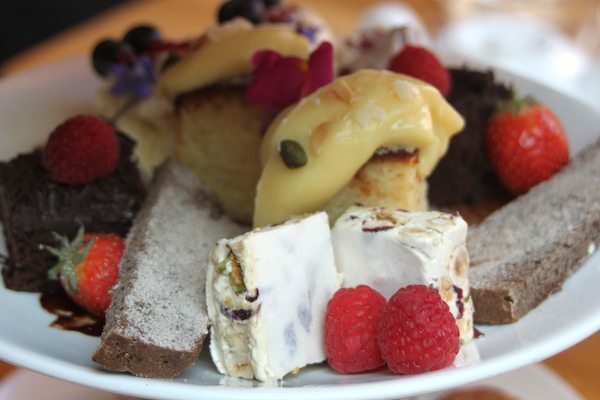 The selection is vast, and considerate of all dietary requirements, including dedicated Vegan and Gluten Free options- three tiers of savoury, scones and sweets, and a choice of tea or coffee pot. 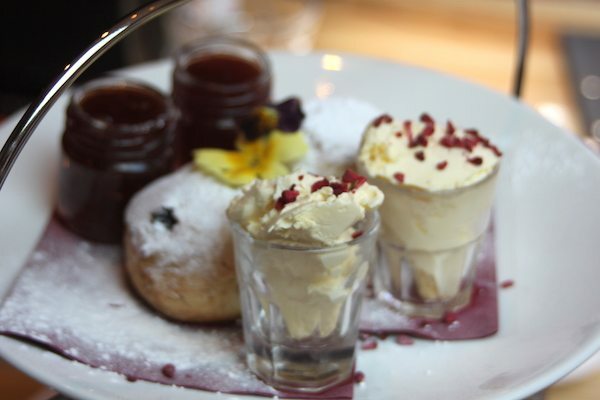 If you think Afternoon Tea is not for you, this might just change your mind! There is the option to order a stand-alone ‘Savoury Tier’, which sounds mouth-watering good. 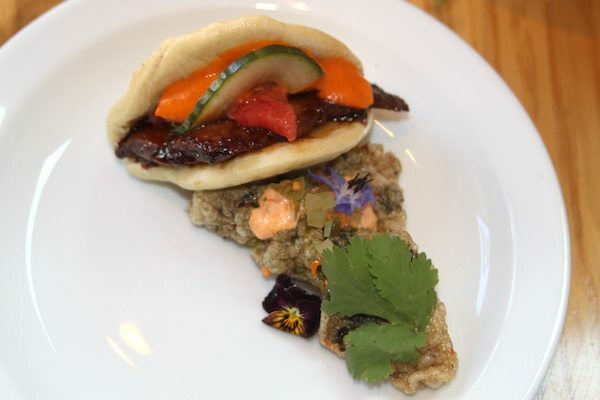 Innovative bites such as Tapioca Crackers with Pickles and Dips, and Steamed Rice Bun Stuffed with Szechuan Marinated Halloumi, Kimchi Chinese Cabbage, Pickled Watermelon and Cucumber, a Miso Chilli Sauce and Spring Onion Garnish – challenge our perceptions! Not shunning the classics, but simply adding their own twist, Terre à Terre make sure those looking for a sugar fix won’t be disappointed. In fact there’s little you are left pining for in the dessert department after casting your eyes over the selection in the ‘Sweet Tier’. Cakes, Nougats and Meringues with Chantilly Cream and Purées, not to mention Tea Soaked Sultana Scones served with Terre à Terre Jam and Clotted Cream. it’s too hard to know what I’m most excited about! If you had thought picking your accompanying drink would be easy, you would be wrong. If you want to further indulge yourself, try a ‘Teatail’ – tea based cocktail, or a dessert inspired cocktail – ‘Liquid Puddings – that pack a punch’, such as an Espresso Martini or a Salted Caramel Appletini. If this all seems like a sugar over-load, a full range of organic Coffees – ground locally by Red Roaster – and Organic Fine Loose Teas, will do very nicely indeed. The tea selection is extensive; Terre à Terre do not do things by halves. Assam, Earl Grey, Darjeeling, Ceylon and those more obscure teas: Keemun Panda, Lapsang Soughong and Wuyi Rock Oolong, to name just some. It seems that this afternoon is going to full of tough decisions. When the waitress comes to our table to take our order we ask for her assistance; does she have any recommendations for us; can she help us out? 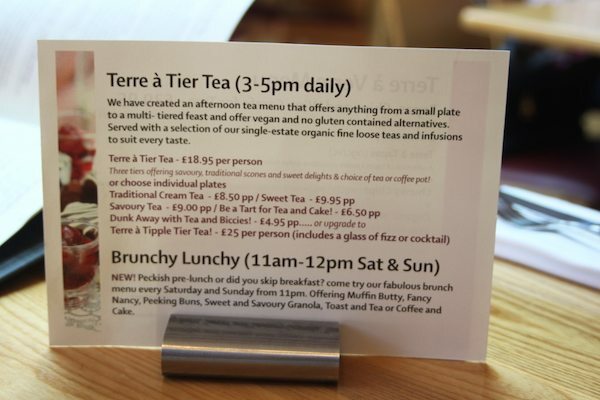 Together we decide that the Terre à Tier Tea – £18.95 per person – is the obvious choice for the indecisive diner. An indulgent three tiers of savoury, scones and sweets with a choice of tea or coffee pot, will surely leave us more than satisfied. As it’s on the menu and sometimes it’s nice to treat yourself – as if I wasn’t already – I also choose to upgrade and dine in style with a glass of sparkling Prosecco. 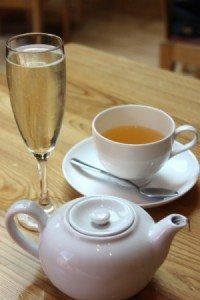 My friend picks the ‘Jasmine Gold Dragon’ tea – he tells me, it’s a bit early for him! The thing that strikes us most about the food when it comes is how beautiful it looks. Peppered with flowers and each element looking distinctly different from the next, the selection of food in front of us has had some serious thought gone into it. The menu tells diners that the Multi-Tiered Afternoon Tea can take up to 30 minutes to prepare – when it arrives, it is clear why. More of a work of art than Afternoon Tea, they assure us ‘it’s is worth the wait’ – we can’t wait to dive in and find out! The different textures and flavours on the Savoury Tier complement each other fantastically. The crunch of the Tapioca Crackers contrast perfectly with the soft and sweet Steamed Rice Bun, and the flavours are inspired; we are intrigued by every bite. Foodie conversation erupts at our table. The Szechuan Marinated Halloumi is particularly interesting; fusing flavours with great success, along with the kimchi and a miso chilli sauce, this quickly becomes the savoury favourite. The Warm Mini Muffins are comforting and balanced, with their Peppered Sussex Slipcote Cream Cheese and Pear Perry Chutney Filling; not a crumb is left of this tier. 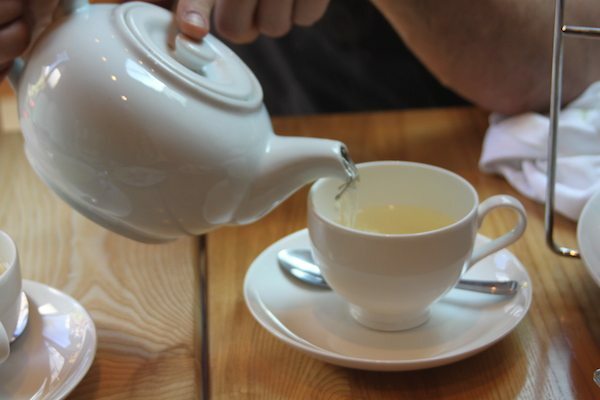 We order a pot of Pai Mutan – White Tea from Fujian in China – to share. We agree that it should work harmoniously with our sugar-course. Again the attention to detail is undeniable: fluffy Lemon Almond Cake served with shiny, syrupy Lemon Curd, with crunchy roasted almonds and pistachios, light and crumbly meringues, beautifully indulgent Chantilly Cream, dense Cinnamon Malt Loaf Toast and sticky, nobly Chestnut and Honey Nougat. There are even some scatterings of blackberries and raspberries to make sure every possible base is covered. 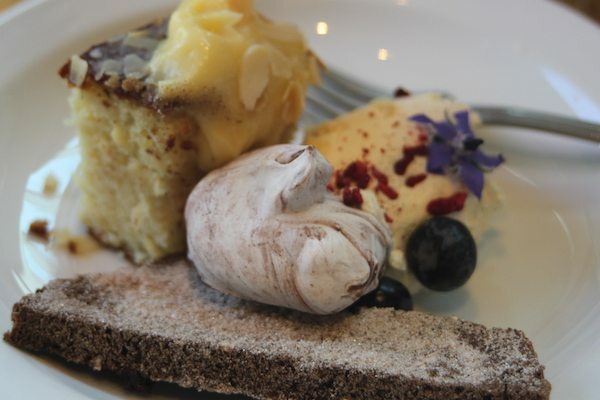 A plethora of colours, textures and flavours excite and spoil us – this is pure decadence on a plate! 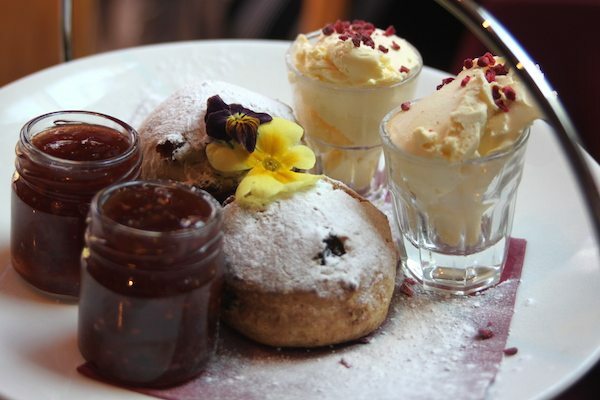 We squeeze in the final tier – the traditional scone course – with some difficulty I must admit. 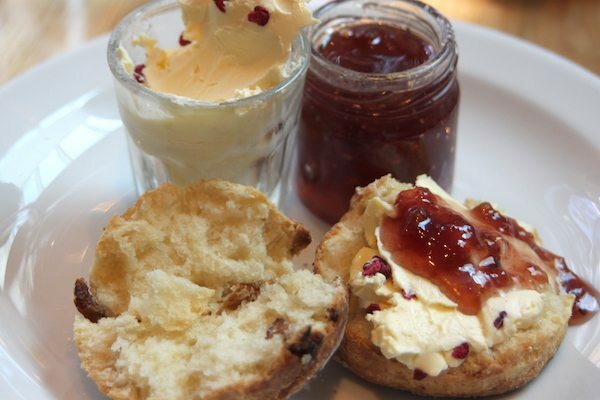 The homemade jam is delicious and who can resist a good smear of clotted cream on a moist and crumbly scone? The predicament here, is it’s just too good to leave! If you are looking for a serious treat, whatever your appetite – modest or very large – the Afternoon Tea menu at Terre à Terre is perfect. You can order any of the tiers on their own should you wish (around £9 per tier), ‘Be a Tart for Tea and Cake!’ and order simply tea or coffee with a choice of cake (for £6.50), or you can go all out like we did. Whatever tickles your taste buds, and makes you go ‘mmmmm’, Terre à Terre’s Afternoon Tea menu will certainly have something for you. 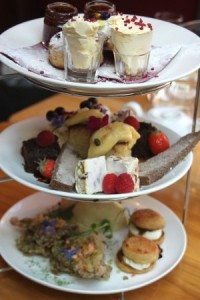 Next time you have an afternoon free and fancy some pampering of the culinary kind, I would highly recommend stopping in at Terre à Terre for some Afternoon Tea – like only they know how!